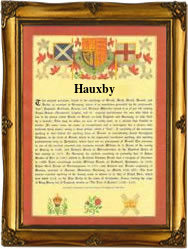 This interesting surname, with variant spellings Haxby, Haxbie, Hauxby, Hacksby, Axby etc., is of English locational origin from a place in the North Riding of Yorkshire called Haxby. Recorded as Haxebi in the Domesday Book of 1086, and as Haxeby in Yorkshire Charters, dated 1228, the place was so called from the Old Norse personal byname Hak meaning "hook", plus the Old Norse "by", a village or homestead; hence, "Hak's by". The surname from this source first appears on record in the latter part of the 13th Century, (see below). One, Gilbertus de Haxby, "girdeler", was noted in the "Register of the Freemen of York" in 1294. Recordings of the surname from Yorkshire church registers include the christening of Jane Haxby in Pateley Bridge on July 7th 1555; the christening of Marie Axbie in Howden on November 30th 1584, and the marriage of Peter Hawksby to Alice Walker in Calverley on July 18th 1666. The first recorded spelling of the family name is shown to be that of Johannes de Haxby, "mercer", which was dated 1272, in the register of the Freemen of the City of York, during the reign of King Edward 1, known as "The Hammer of the Scots", 1272 - 1307. Surnames became necessary when governments introduced personal taxation. In England this was known as Poll Tax. Throughout the centuries, surnames in every country have continued to "develop" often leading to astonishing variants of the original spelling.